Although wireless energy transfer is an old idea (Tesla patented one design in 1901), technological advances and the rise of portable devices have made it relevant again for different applications, such as wireless charging and energy harvesting. This webinar will consist of two parts. The first part is a review of low frequency power transfer in two categories: short range-inductive charging and powering of electronic devices and electric vehicles, and mid-range power transfer through coupled resonant circuits. The second part of the webinar is concerned with wireless energy transfer over longer distances, where the far-field transfer of RF energy may be used. Satellites provide a challenging environment for electromagnetic components and antennas. The limited available space has to be shared by multiple tightly-clustered systems that have to operate correctly in extreme thermal conditions. Electromagnetic simulation plays a critical role in ensuring that mission-critical components work as intended once in orbit. This webinar will give an overview of how the range of simulation tools in CST STUDIO SUITE&reg; can be used to design and optimize antennas and components quickly and with high accuracy. Multiple-input, multiple-output (MIMO) systems are a major field of study for researchers interested in achieving high data rate communication in typical urban multi-path environments. This webinar will show how simulation can be used to calculate the effect of hand and head (e.g. CTIA models) on mobile devices, MIMO for wearable antennas and different power weighting functions for different environments, along with post-processing options for envelope correlation (including spatial power weighting functions), derived quantities&nbsp; diversity gain and multiplexing efficiency. Learn what&#39;s at the heart of CST simulation software in this short video and discover the advantages CST STUDIO SUITE&reg; can offer in the product design and development process. Computer Simulation Technology (CST) will host the CST Modeling Challenge at European Microwave Week (EuMW) 2017, Stand 105. Entrants will design and simulate a waveguide filter, and all successful participants will be entered into a prize draw. CST – Computer Simulation Technology (CST) announces a new series of webinars showing the best way to get ahead with EM simulation. These webinars will cover both CST tools and products from CST’s partners Magus Pty. and Optenni Ltd.
Aerospace engineers use CST STUDIO SUITE to design and optimize antennas and arrays, to analyze their installed performance, and to calculate cosite interference between antenna systems. The upcoming release of CST STUDIO SUITE 2015 will significantly enhance its antenna design offering with the integration of the new Phased Array Wizard. Planar filters are widely used by engineers developing low-cost or compact printed electronics for applications such as networking, communication and signal processing. For these filters, the design process typically has two stages. The first step is selecting an appropriate filter topology from a synthesis tool or textbook and calculating the filter coefficients that match the specification. The second step is analyzing and fine-tuning the filter through simulation or prototyping to ensure that it operates correctly when installed. By incorporating electromagnetic (EM) simulation tool, CST STUDIO SUITE®, into their compliance process, Airbus Defence and Space were able to accurately characterize how their test chamber was affected by a change to the electromagnetic compatibility (EMC) testing standard. Welcome to the April edition of CST E-News, our series of regular news and feature updates. We hope that you find the contents relevant, interesting and informative. Any feedback and suggestions for future editions are welcome and can be sent to news@cst.com. 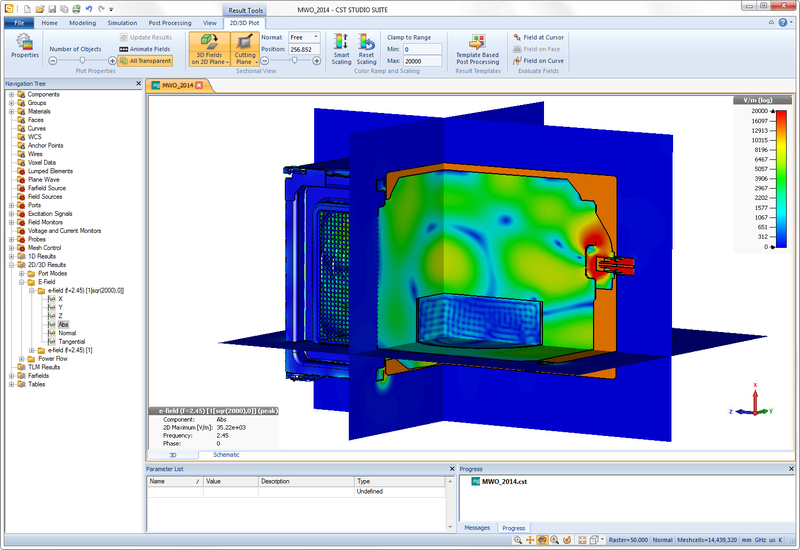 Computer Simulation Technology AG (CST) announces a series of webinars to accompany the release of the 2014 version of CST STUDIO SUITE. The webinars will demonstrate the new features and tools available and their application to the areas of microwaves, RF and optical, EDA and EMC/EMI and low frequency simulations. Version 4.5 of Antenna Magus, a software tool that helps engineers design and model antennas, is now available. In the new release, an additional seven new antennas have been added to the database, increasing the number of antenna templates to 225. The CST Webinar Series is back again this year! Beginning in September and running until December, the free webinars are a great way to both introduce you to the decisive advantages of electromagnetic simulation and equip you with techniques that help to shorten the design cycle and reduce the number of costly prototypes needed. CST STUDIO SUITE® 2013 introduced several new features – most notably, the new Ribbon-based interface. We’re pleased to say that customer feedback has been positive, and their comments steered the development of Service Pack 2, which is currently being distributed through the Automatic Update System. Computer Simulation Technology AG (CST) announces a series of interviews highlighting the groundbreaking research carried out by previous winners of the CST University Publication Award. Computer Simulation Technology AG (CST) and Delcross Technologies (Delcross) have signed a distribution agreement to make CST the authorized reseller of EMIT and Savant. Computer Simulation Technology (CST) launches a new product that analyzes PCBs with respect to EMC and SI related design rules. Design engineers dealing with electromagnetic compatibility (EMC) and signal integrity (SI) of PCBs, can now employ CST BOARDCHECK™ to get a quick overview of potential problems in their layout. CST BOARDCHECK supports a multitude of popular layout formats such as CADENCE® ALLEGRO®, Zuken CR 5000, Mentor Graphics® Expedition® and ODB++, which are read-in using the sophisticated CST STUDIO SUITE® import filters. Researchers and engineers use CST STUDIO SUITE for the design of EM based components in application areas as diverse as MW&RF component design, EMC and signal and power integrity analysis. CST’s latest software release, CST STUDIO SUITE version 2012 and its multitude of powerful new features and functionality, can help them to streamline their workflows and shorten development cycles. The most significant development in this respect is System Assembly and Modeling. CST previewed the release of its new CST PCB STUDIO 2012 at DesignCon 2012.The new CST PCBS IR-drop solver quickly calculates current distribution and voltage drop on multilayered PCBs. CST BOARDCHECK is an EMC and SI rule checking program that reads popular board files from Cadence, Mentor Graphics, and Zuken as well as ODB++ (e.g. Altium) files. It checks the PCB design against a suite of EMC or SI rules. The kernel used by CST BOARDCHECK is the well known software tool EMSAT. Antenna Magus is a software tool to help accelerate the antenna design and modeling process. It increases efficiency by helping the engineer to make a more informed choice of antenna element, providing a good starting design. Validated antenna models can be exported to CST MICROWAVE STUDIO® from a huge antenna database which means that the engineer can get to the customization phase of an antenna design quickly and reliably. Optenni Lab is a novel software with innovative analysis features that increases the productivity of antenna designers and speeds up the antenna design process. Optenni Lab offers fast fully automatic matching circuit optimization tools, estimation of the obtainable bandwidth of antennas and calculation of the worst-case isolation in multi-antenna systems. This application note illustrates how CST MICROWAVE STUDIO® (CST MWS), Antenna Magus and Optenni Lab can be used in combination to improve an existing GSM tracking device application. The requirement was to replace an existing “off-the-shelf” antenna on a GSM tracking device with an embedded, integrated antenna in order to reduce manufacturing and component costs. The modern car includes an ever-increasing number of wireless systems. These require an assortment of different antennas, often mounted in close proximity. Coupling between these antennas can lead to cosite interference effects, degrading the performance of the systems or disrupting them altogether. This article demonstrates how a full-wave simulation in CST MICROWAVE STUDIO® (CST MWS) can be combined with RF cosite interference analysis in Delcross EMIT to identify and mitigate EMC/EMI problems. In this article we discuss the design and implementation of high-power-microwave (HPM) traveling-wave antenna. The antenna is designed to be driven by a high-power, single-shot signal generator with 1 ns pulse-width at the -3 dB power points, and peak voltage of up to 100 kV. Since the signal generator is equipped with an air-filled coaxial-waveguide output, a coaxial-waveguide to parallel-plates transition was also designed and fabricated. A typical smartphone handset can contain numerous different RF systems, including multi-band cellular antennas, Wi-Fi, Bluetooth, NFC and navigation systems such as GPS and GLONASS. All these systems need to be able to coexist without causing cosite interference. This application note shows how CST STUDIO SUITE® and Delcross EMIT can be used to investigate interference between antennas on a smartphone, and how potential mitigation strategies can be investigated using simulation. To enable widespread adoption of satellite broadband, especially for mobile users, Kymeta is developing and marketing mobile satellite communications terminals using a new reconfigurable antenna technology known as Metamaterials Surface Antenna Technology (MSA-T). This success story looks at how CST STUDIO SUITE was used in the design of these metamaterial antennas. The door to a microwave oven forms part of the heating cavity, allowing access to the oven interior. The seal around the door is never perfect, so electromagnetic fields will leak out of the oven, potentially interfering with other electrical equipment or exceeding safety limits for power levels in human operators. Oven designs have to meet legal requirements for the amount of power which can leak beyond a certain distance from the oven (due to human exposure concerns), and also have to meet electromagnetic compatibility (EMC) requirements. This article discusses how electromagnetic simulation can be used to design effective shielding mechanisms in order to adhere to these standards. In this article we discuss the design and implementation of high-power-microwave (HPM) traveling-wave antenna. The antenna is designed to be driven by a high-power, single-shot signal generator with 1 ns pulse-width at the -3 dB power points, and peak voltage of up to 100 kV. The cavities of microwave heating devices need to be carefully designed in order to ensure safe, efficient operation and homogeneous field distributions. The size, the number of modes and the resonant nature of a cavity can pose difficulties for their simulation. This paper discusses the modeling of microwave cavities and demonstrates how a system for heating test samples was optimized using electromagnetic simulation. 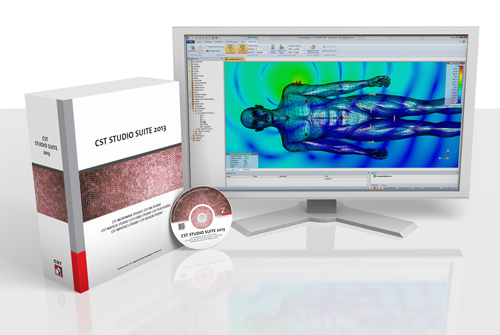 CST STUDIO SUITE® is a package of tools for designing, simulating and optimizing electromagnetic systems, and is used in leading technology and engineering companies around the world. The three pillars of CST’s products are accuracy, speed and usability. One common application of printed arrays is in wireless local area networks (WLAN). This article explains the design process for a planar microstrip patch array for WLAN frequencies using the circuit and full-wave 3D solvers and optimization tools in CST STUDIO SUITE®. This application note illustrates how CST MICROWAVE STUDIO®, Antenna Magus and Optenni Lab can be used in combination to improve an existing GSM tracking device application. The requirement was to replace an existing “off-the-shelf” antenna on a GSM tracking device with an embedded, integrated antenna in order to reduce manufacturing and component costs. The modern car includes an ever-increasing number of wireless systems. These require an assortment of different antennas, often mounted in close proximity. Coupling between these antennas can lead to cosite interference effects, degrading the performance of the systems or disrupting them altogether. This article demonstrates how a full-wave simulation in CST MICROWAVE STUDIO® can be combined with RF cosite interference analysis in Delcross EMIT to identify and mitigate EMC/EMI problems. Electrically large structures such as aircrafts, ships, land vehicles and satellites have demanding and complex electromagnetic environments. CST STUDIO SUITE® brings together 20 years of experience in the simulation of 3D microwave & RF components, antennas and systems. It is used by government agencies and defense contractors world-wide on a daily basis for mission-critical projects. Read about how the tool is used within the defense industry to analyze antenna placement and co-site interference, electromagnetic environment effects, and radar. When a printed circuit board (PCB) includes a power plane that is near to signal traces or other power planes, there is a significant risk of energy transfer between parts of the system. Not only does this coupling lead to power switching noise being transferred into data signals, it also means that power supply systems may demonstrate additional resonances that are not seen in the individual components. This can affect the power integrity of the PCB and may reduce its speed or reliability. This paper will explore some of the potential power integrity issues that can affect a PCB and explain how simulation can be used to help reduce these effects. In the world of electromagnetic and electromechanical design, state-of-the-art Finite Element simulation is critical to the virtual testing of new concepts and optimization of existing designs. CST EM STUDIOÂ® is a specialist tool for the static and low frequency simulation, design and analysis of electromagnetic devices. GPS receivers (RXs) are ubiquitous in modern life and are relied upon for everything from personal navigation using the GPS embedded in most mobile phones to mission critical functions in commercial and military vehicles. EMIT provides a powerful simulation on capability to predict interference in complex RF environments. In this application note we present the use of EMIT for the prediction of interference in a GPS RX due to a nearby out-of-band TX. Savant includes creeping-wave physics, a powerful feature that works with and augments Savant’s baseline shooting-and-bouncing rays (SBR) solution to improve accuracy for antennas mounted directly on curved structures. The high memory bandwidth and parallel processing abilities of GPU cards mean that GPU computing can provide signifi cant simulation speed advantages over conventional CPU computing. CST STUDIO SUITE® supports GPU computing in the transient solver, integral equation solver and particle-in-cell (PIC) solver, using NVIDIA Tesla® GPU cards. By law, products must comply with international EMC standards which have been developed to regulate electromagnetic emissions and the susceptibility of electrical and electronic systems. Striking a balance between EMC and competing design requirements poses major challenges to engineers. By including EMC compliant design at an early stage, additional costly development iterations can be avoided later on down the line. Pulse Electronics Mobile Division produces compact antennas for mobile communications and networking. Mobile antennas need to function in complex and mechanically limited environments, and so most antennas used today are specially designed and customer-specific. This article showcases how Pulse Electronics used 3D EM simulation software to improve antenna evaluation and reduce product design lead time. Electromagnetic environmental effects (E3)  can cause electronic devices to malfunction or fail altogether. High Intensity Radiated Fields (HIRF) , from sources such as TV and radio stations, radar and satellite communication systems, may disturb the safe operation of aircraft electronics. The behavior of aircraft when exposed to a HIRF environment can be simulated effectively using CST MICROWAVE STUDIO® (CST MWS). With CST MWS, surface current and field distributions can be calculated and the coupling into shielded structures predicted. Optenni Lab is a novel software with innovative analysis features that increases the productivity of antenna designers and speeds up the antenna design process. Optenni Lab offers fast fully automatic matching circuit optimization tools, estimation of the obtainable bandwidth of antennas and calculation of the worst-case isolation in multi-antenna systems. With these tools the antenna designer can quickly evaluate various antenna designs and concepts, including multiport antennas and tunable matching circuits. Optenni Lab is very easy to use and does not require specialist know-ledge in impedance matching. CST PARTICLE STUDIO® (CST PS) is a specialist tool for the fast and accurate 3D analysis of charged particle dynamics in 3D electromagnetic fields. As a member of CST STUDIO SUITE®, CST PS is fully integrated in the CST design environment, taking advantage of the standard-raising user interface as well as the solver technology of our multi-purpose electromagnetic modules CST MICROWAVE STUDIO® (CST MWS) and CST EM STUDIO® (CST EMS). CST CABLE STUDIO ™ is focused on the analysis of SI, EMC and EMI effects on single wires, twisted pairs, or on complex cable harnesses with an unlimited number of cables. The cable placement is flexible. The interaction of electromagnetic fields and biological tissues is relevant in various technical applications. The design of medical equipment and treatment plans generally benefits greatly from simulation; additionally, simulation can give insight into living tissue where measurement is almost impossible. This also holds for all kinds of wireless communication devices surrounding us such as mobile phones, where Specific Absorption Rate (SAR) planning is essential at an early stage of the design. CST STUDIO SUITE® offers a broad range of hardware based acceleration methods. The systems that are supported range from single off-the-shelf workstations to high-end cluster based solutions. EMIT provides an easy-to-use software framework for managing RF system performance data, simulating cosite interference effects, and evaluating mitigation strategies, resulting in a comprehensive model maintainable over the life of a platform. Savant is a leading-edge tool for simulating the installed performance of antennas located on electrically large platforms. Using a powerful high frequency EM ray-tracing engine, Savant provides the power to efficiently simulate antenna-to-platform and antenna-to-antenna coupling performance in environments involving electrically large platforms. This whitepaper gives a general overview on different concepts of photonic crystal cavities. Important figures such as the transmission, the mode volume and the quality factor are discussed. The presented information will help the reader to decide which type of photonic crystal cavities will be most suited for the application in view. In this paper a modular approach using the so-called System Assembly and Modeling (SAM) of CST STUDIO SUITE® is used to optimize a reflector antenna system in a piecewise manner. The results are compared to a full system simulation. Sirona products are to be found in all fields of treatment and activities in a modern dental practice. These include, in addition to treatment equipment and instrumentation, the business division CAD/CAM Systems (production of ceramic inlays, onlays, partial crowns etc) and imaging systems with its products for X-Ray diagnosis. The use of EDA software for simulating PCBs and minimizing board-level interference in car radios are well established, but the use of 3D simulation techniques for system level field simulations and optimization of the housing was a new development to further improve quality. A full-wave 3D electromagnetic simulator can be used to simulate and visualize the propagation of electromagnetic fields across PCBs. This article will describe how CST MICROWAVE STUDIO® can be successfully used to characterize the response of high-speed channels, and how typical SI results and eye diagrams can be numerically calculated to predict the response of a channel. Impedance matching is an essential part of antenna design. The input impedance of an antenna needs to be reasonably close to the amplifier impedance, otherwise the signal is reflected back to the amplifier and not radiated by the antenna. This white paper discusses the optimization of matching circuits especially to antenna applications. The presence of multiple communication antennas on a tower means that antennas may have to be installed in sub-optimal positions. Electromagnetic simulation can be used to design and optimise the positioning of the antennas on the tower. This article will describe how multiple solvers in CST MICROWAVE STUDIO® can be combined to predict where to install an omnidirectional stacked bicone antenna array to minimise loss of omnidirectionality. Microdul produces proximity sensor chips that can be used with remote sensing plates. Changes in plate capacitance are detected by a digital auto-calibrating algorithm. An approaching human finger typically causes a switching operation. The main challenge is to develop a sensor which can reliably distinguish between intentional switching operation and environmental interference.